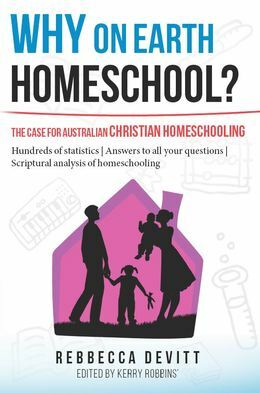 Introducing Australia's FIRST book on Australian Christian Homeschooling! Finally a book on Christian Homeschooling that will help you to discover the facts! Take an exciting and unique look at what homeschooling can mean for your child. Filled with entertaining and engaging stories and research studies, this 285-page book integrates the theories and experts of many homeschooling experts. Discover how to grow spiritually, morally and educationally advanced children! No matter what stage your child is at, homeschooling is always an option. Answering all your questions, this book is for prospective parents, parents with young children, parents with children in school and homeschooling parents. This book is for you! PLEASE NOTE: No teaching anywhere on this website is intended, or should ever be construed to intend, to justify or to in any way incite or encourage personal vengeance or physical violence against any person. SCRIPTURE QUOTES are generally taken from the New King James Version (NKJV), copyright 1982, 1988 by Thomas Nelson, Inc., used by permission. All rights reserved.